Our Massive C-RAN DSP Engine is the largest C-RAN DSP Engine in the market. It has 64 10Gbps CPRI, capable of supporting the DSP processing of the IQ streams of up to 512 Tx/Rx radios, either for Distributed Massive MIMO or resource pooling at the lower PHY level in a C-RAN network. 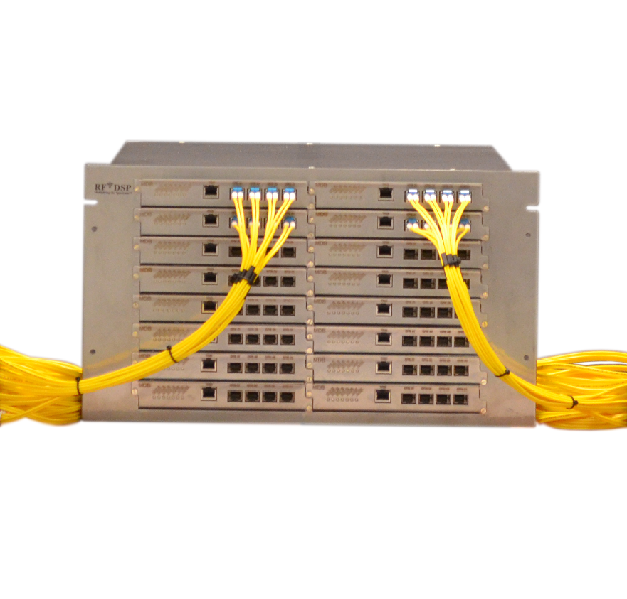 It is compliant with LTE and CPRI standards. The Engine contains 17 Virtex 7 FPGAs, interconnected by 64 10Gbps Auroa links. It is capable of 40 Tera MACs per second. The Engine connects to a server rack via 24 lanes of PCI2 Gen 3 at 24Gbps. It is equipped with a GPS module and can also accept an external 1 pps source. The master clock can be distributed over the CPRI link to all 512 Tx/Rx radios. By pooling up to 512 Tx/Rx paths into a single highly connected engine, it takes C-RAN to another level, allowing resource pooling, and SDN/NFV at the lower PHY layer. Contact us by email or phone for technical support, prices and custom design services.